banjira 97 Inch Tibetan Rag Dung Telescoping Brass RD96. 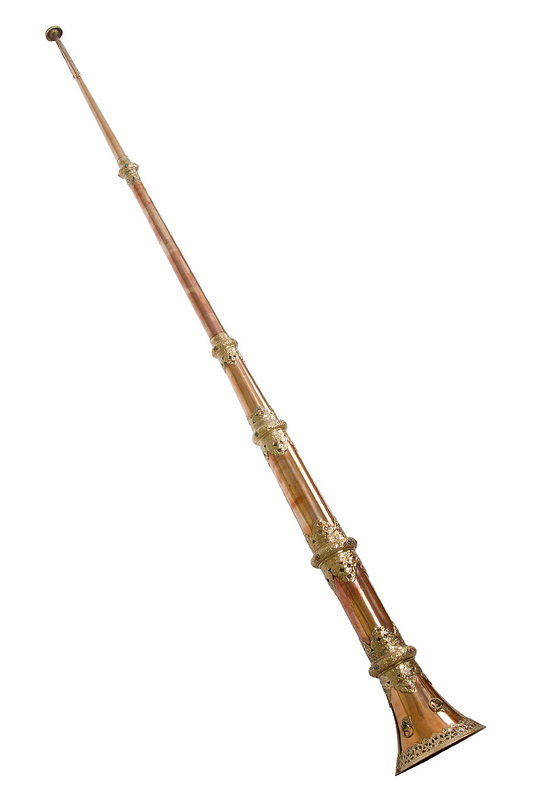 Handmade extra-large long copper trumpet called a rag-dung that is approximately 97" in length fully extended that telescopes in 3 sections. Decorated throughout with repoussé brass cuffs dotted with red and turquoise stones. A rag-dung is also called a dung-chen and is an ancient instrument associated with Buddhism that is played for preludes, processions, as well as morning and evening calls to prayer. Trumpets like these were used in ensemble playing, while larger ones 12 to 15 feet were used in processions. The large trumpets would be carried on the shoulders of monks, or supported on boxes when they were played in processions. These trumpets were also played on rooftops to alert the villagers and ancestral spirits of upcoming feast days.